The album "Majar" was sent to me by Dr. Khonji. I loved the cover because of the artistic design. However, once I listened to the album, I was really impressed with the beautiful music and the selection of songs. The collaboration is in perfect harmony and Konji's voice is heart warming. Overall this is a great Persian folk album with a fresh approach and modern edge. I am truly honored that Dr. Khonji and this group of talented artists have furnished the CD. 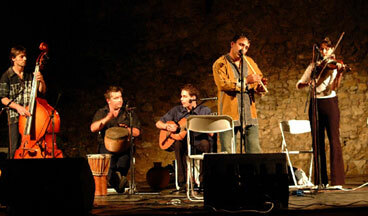 Golestan is a Southern-Hungary-based world music group of Hungarian folk and rock musicians led by Dr. Khonji, a Persian living in Pécs, Baranya. We perform our songs in Achom, a South-Iranian language of the Khonj community. Our musical arrangements are of a hybrid style including Persian nomadic, Hungarian, Gypsy and other popular elements.